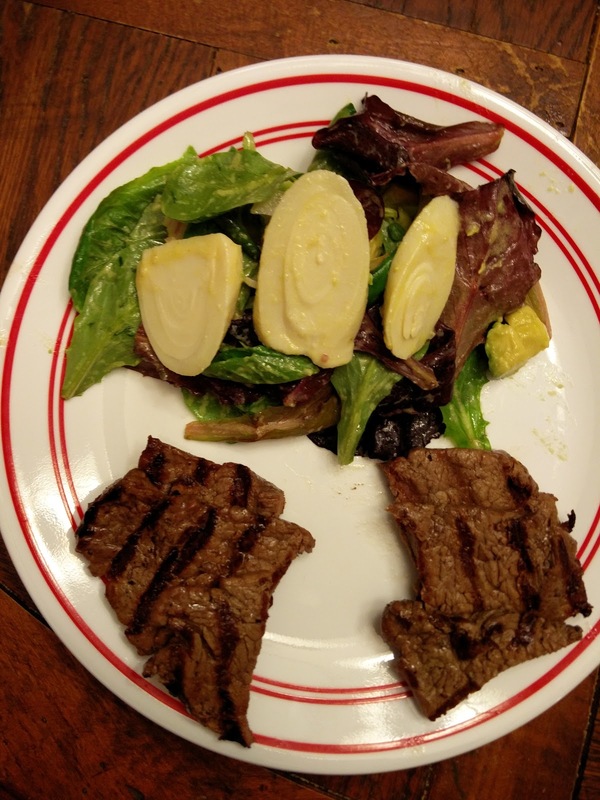 Tonight, we made a hearts of palm salad with pounded beef tenderloin. Our local store did not have watercress that the recipe calls for, so we used baby romaine lettuce instead. We also don't have a grill pan, so instead we simply used our gas grill. 1 pound center-cut beef tenderloin - we ended up with 3 pieces that we had to butterfly - pounded to about 1/8 of an inch thick. Between and 1/8 and a 1/4 should be okay, depending on how you like it. 1. Heat the grill to medium high. 2. While the grill is heating, make the salad: In a large bowl, whisk the 2 tablespoons of oil with the lemon juice, shallot and mustard. Add the salad greens of your choice, hearts of palm and avocado. You can now plate your salad. 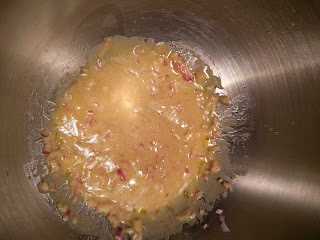 Add steak after it's cooked. 3. Brush the steaks with oil and rub with butter; season with salt and pepper. Grill over medium high heat for about 1 1/2 minute per side for well done or about 1 minute per side for medium well. You can cook it to your tastes. Transfer to plates with the salad. The steak was excellent. It was the best filet mignon we've ever made, and also the quickest. It cooked super quick! 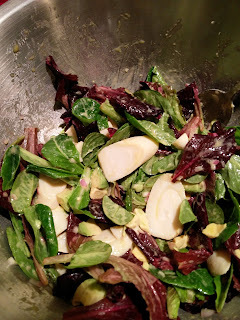 The salad was really good; the hearts of palm were great and provided a unique flavor and texture in the salad. Nick was suspicious of pounding the steak - however, it actually ended up making the filet mignon more tender and juicier even though it was counter to all previous steak experiences. 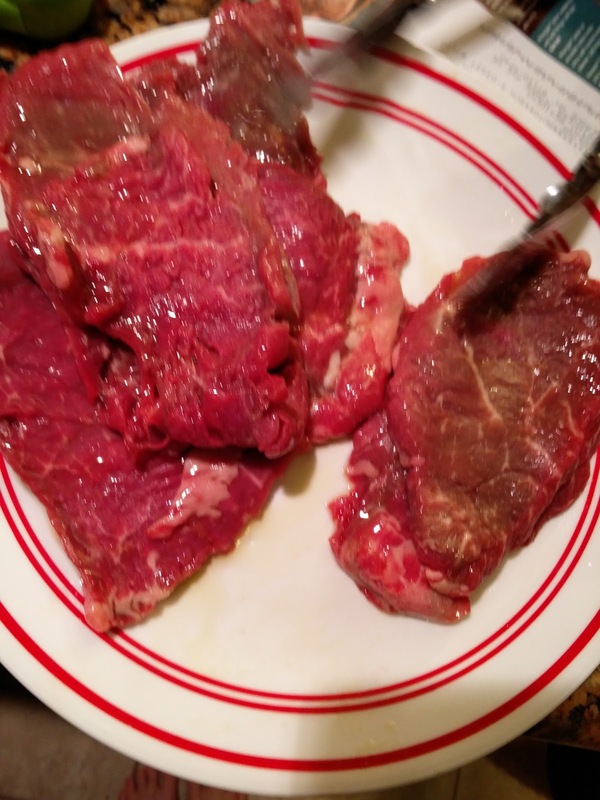 The salad did not complement the steak very well. It was good individually but the steak could have used a better, perhaps more traditional side. He just ate pepperoni. The steak and salad did not warrant his attention. Make a baked potato side for the steak. We would do a slow cooked baked potato with this steak next time.